Back home again for the annual St.Lucia Jazz Festival, May 4 to 13, 2007. Anyway I arrived early to catch the 'Rodney Bay Music Bash, April 23 - 25, 2007, featuring Beres Hammond, David Rudder, Sean Paul, Destra, Shaggy & Maxi Priest (all Caribbean performers). 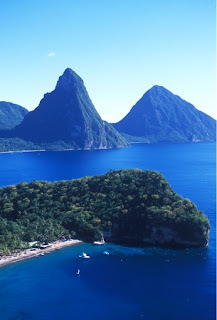 The Pitons (seen in the picture to the left) are two volcanic plugs in a World Heritage Site in Saint Lucia. The plugs are 770 m and 743 m high respectively and linked by the Piton Mitan ridge. In 2005, Oprah Wnfrey recommended The Pitons as a must see in one's lifetime. So when I saw the website for St. Lucia's own-brand beer, 'Piton', also named after these two mountains, I knew I had to share. I had to show my beautiful island, hopefully to tempt you to visit some day soon! 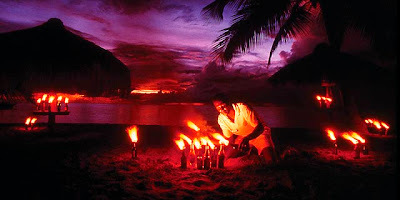 Ladies, St.Lucia is also a perfect honeymoon destination. A "Tropical Villa" in St. Lucia offers romantics privacy, families freedom and everyone luxury and personal service. Our villas range from one to nine bedrooms. Most of them are set in a landscaped garden high in the hills of Cap Estate with spectacular sea views. 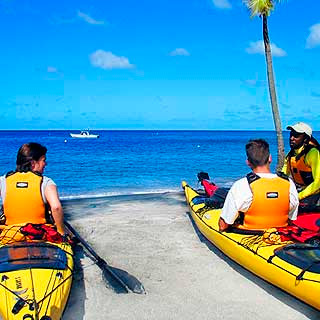 Others are located in Rodney Bay, the center of tourism activity, shopping and water sports, in Bois D'Orange, on the Vigie peninsular and in Soufriere home of the Pitons. A few are within walking distance of a beach. All have private swimming pools, with the exception of the townhouses in Rodney Bay which share a large pool in a beautiful garden. Ever since architect Nick Troubetzkoy first purchased the first 14 hillside units, and throughout the expansion and renovation that followed, design in harmony with nature, complementing the island’s natural beauty, has remained his focal point. The 600-acre site is a lush garden of tropical foliage bordering one of the island’s best beaches, where soft silver sands dip into the clear turquoise waters of the Caribbean. Anse Chastanet Resort VOTED ONE OF THE CARIBBEAN'S TOP 25 - '05, '06 & '07! Marigot Bay, located a few miles south of Castries on St Lucia’s scenic west coast, is known for its picturesque beauty and charm. Doubloon International, the developers of the luxury 124-room Discovery at Marigot Bay resort which opened fall 2006, have embarked on a marina redevelopment project which has already seen the construction of 40 new fully serviced berths and a grid of mooring buoys in the inner bay. The Marina Village is a wonderful example of St Lucian architectural heritage with a contemporary flair. This colourful wooden village offers a number of high-quality interesting boutiques, apartments, a small supermarket, banking facilities, car hire, art gallery, laundry, bath house and other services all set around an attractive courtyard overlooking magical Marigot Bay. And twelve loft apartments with spectacular views of the bay complete the village atmosphere, some of which are available for rent. Marigot Bay already boasts several classic Caribbean restaurants and bars, which have always been popular with seafaring visitors. Immigration and other services are also available in the bay. I wish I was there right now! My mom is getting ready to go down for Jazz (family from St. Lucia).